Webkinz Signature Miniature Dachshund are not only cute stuffed animals, they include hours of fun on the computer. After purchasing a webkinz pet, go to http://www.webkinz.com to adopt it, name it, and create a home for it to play in. Ms. Birdy will guide you through registration at the adoption center. You'll receive your pet's biography letting you know its favorite foods and secret wishes too! Dr. Quack gives your pet an examination and from there you keep your pet healthy by feeding it, playing with it, and buying it things at the W Shop (with fake money). You will automatically receive 2000 in kinz cash (fake money) when purchasing a pet, however, you can play educational games at the arcade or Quizzy's Question Corner to receive more kinz cash. This is one of the hottest and most popular toys of 2010. 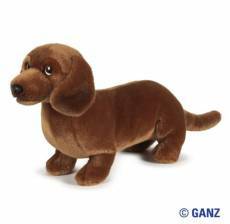 Webkinz Signature Miniature Dachshund will make a great pet. Webkinz are stuffed animals originally released by the Ganz gift company in 2005. The toys are similar to many other small soft toys, however they come with a special code on their labels that allows access to the "Webkinz World" website to "adopt" a virtual version of the pet for virtual interaction. A Webkinz Signature Miniature Dachshundis a wonderful pet. They are very lifelike and high quality crafted. Signature pets come with special items that regular Webkinz do not provide.